Unclip cover 4 or 6 by sliding a flat tool (or the key integrated in the RENAULT card) under the cover. 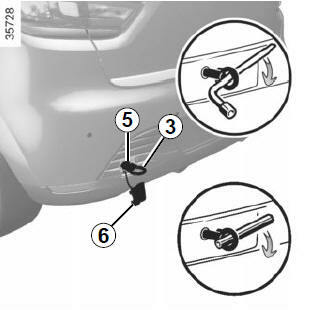 Tighten towing hitch 3 fully: as much as possible by hand at first, then finish tightening it using the wheelbrace or, depending on the vehicle, the lever. Only use the towing eye 3 and the wheelbrace located under the luggage compartment carpet in the tool kit (please refer to the information under “Tools” in Section 5). Use a rigid towing bar. If a rope or cable is used (where the law allows this), the vehicle being towed must be able to brake. A vehicle must not be towed if it is not fit to be driven. Avoid accelerating or braking suddenly when towing, as this may result in damage being caused to the vehicle. When towing a vehicle, it is advisable not to exceed 30 mph (50 km/h). Do not push the vehicle if the steering column is locked. Do not leave the tools unsecured inside the vehicle as they may come loose under braking.